Velvet Paw Creations: "We're So Proud" A Clean & Simple Card that packs a punch with a splash of colour! 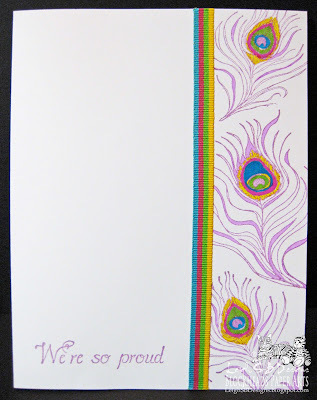 "We're So Proud" A Clean & Simple Card that packs a punch with a splash of colour! I'm back with another Peacock themed project featuring Blockheads Paper Arts stamp set 'Proud As A Peacock' which will be available for purchase next week! Woohoo! My first card, "Twilight Serenade", was quite an involved project with lots of different techniques going on so I thought I'd share a clean and simple card today that still makes a statement with a splash of bright colour! Make a folded card from white cardstock and mask off a narrow panel down the right hand side with low tack tape or post-it notes. 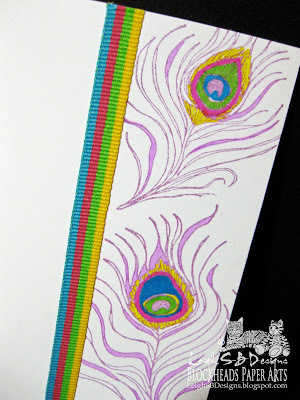 Stamp the large and small single peacock feather images with Brilliance Purple Pearlescent ink and heat set. You can see the pearlescent shimmer of the feathers in the photo below. Colour the centers of the feathers and random feather strands with either dye-based Memento markers or water-based Marvy Le Plume II markers in bright colours. Adhere a piece of colour co-ordinated ribbon (Target $1 section...one of my fav places!) to the card with double sided tape. By the way, the ribbon IS straight! The card had a slight curve/bulge to it along the bottom edge and I couldn't get it to co-operate and stand straight, uuggh. I'm sure it's bothersome to your eyes and it's still bugging me big time LOL! 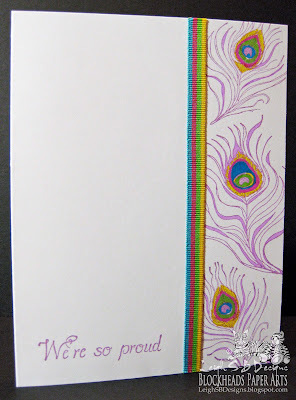 Stamp the sentiment "We're so proud" in Brilliance Purple ink along the bottom edge on the left hand side of the card. If you're not confident about eye balling the placement then use a Stamp Positioner tool to get the sentiment exactly where you want it! Here's a neat idea for this kind of card especially if lots of people are going to sign it! You can write messages on the front of the card in the white area as well as all over the inside and the back. Great for large family gatherings like graduations and perfect for a co-worker so the whole company has space to write their kudos in! Now I've got a challenge perfect for this one - thanks for the heads up Colleen! WOW I really love your colorful feathers, that looks awesome!! Way to go, working the CAS peacock feathers, Leigh! I never thought to go so CAS with it, but it really works. Love the shimmer too. Very pretty, Leigh! Sometimes less is more! Love this! Love what you've done with that stamp set. On my wish list! Love all the different things you did with the peacock feathers. Just beautiful! This is just stunning! Love the bright colours against the white. Brilliant! Thank you for all your wonderful comments, I truly appreciate them!